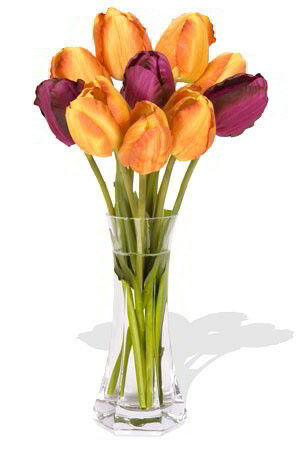 The little brother to "Celebration", these 10 mixed tulips will make anyone happy and put a playful smile on their face!Vase not included but if you are hoping to bring an even larger smile to the lips of your special someone, we recommend the Premium Vase to perfectly complement these Playful Tulips. My partner loved it and she never expected the flowers :) twas her favorite (tulips) and yeah im glad i found your website! Thank you! You made our 8th month memorable.. and to add, twas her first time to received a flower :) so yeah super duper thanks! Til my next transaction! Excellent service - my mum was thrilled with the tulips. Thank you for the excellent service. Most appreciate. My regards to the zFlowers.com team. Ordering Flowers through zFlowers.com was an easy, no fuss process. I made some mistakes while ordering but your staff did I wonderful job helping me out and making sure my order made it. I can't say enough nice things. my friends loved the flowers I sent to them!